Grosse Pointe South High School built a new Natatorium for their students. The school originally planned to build a pool with eight lanes. Some parents thought adding four more lanes would make the pool more useable for competition and events beyond normal school functions. These parents decided to commit to funding the additional costs for the four new lanes. A design was submitted to highlight and recognize the donors to this great project. The Grosse Pointe South High School team mascot was the Blue Devil, and this logo was also incorporated into the wall design. 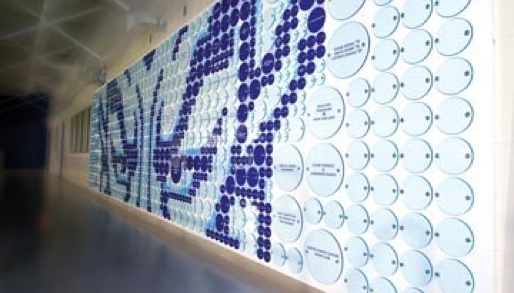 The finished Donor wall overlooks the pool, giving competitors the evil Blue Devil eye during swim meets!